Please note that this is an archive website of the World Science Forum series. 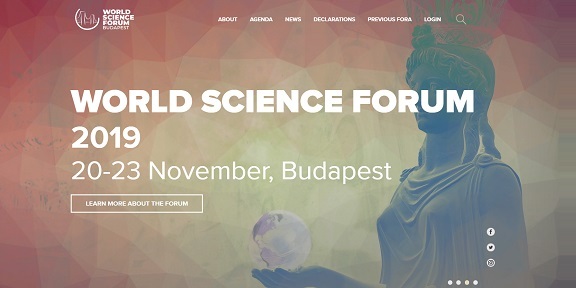 To learn more about upcoming events please visit our new website at the www.worldscienceforum.org address! PLENARY SESSION I. “SUSTAINABILITY CHECK 2015"
"Science has become a global enterprise." "By bringing together policy makers, scientists, representatives of international organisations, academic institutions, and media, World Science Forum has become a unique platform for exchange and reflection on science and its role in meeting the urgent challenges that humanity is facing." "Science has been and continues to be the main contributor towards development, but we need to be honest: science played an important role in the construction of the world that we are now trying to change. Now it needs to revert this process"
"International cooperation is the new standard model for innovation. The issue is not whether international partnerships are necessary and vital but how we can make partnerships work faster, smarter and better." "There’s no science without technology. Science is more the knowledge and technology is the know-how." "We have the responsibility to incorporate much more expertise and knowledge in our local and global decision making." "Science has the responsibility to become the ethical beader in helping human evolution in future, because nobody else is really that qualified or able to do that." Janssen Pharmaceutical Companies of Johnson & Johnson, Inc.
"The threat is real, our time is limited, but we can still make a change" urged János Áder President of Hungary at the Closing Ceremony of World Science Forum 2015. At the Opening Ceremony of World Science Forum 2015 a panel of global thought-leaders declared renewed intent to fight poverty and promote just, equitable and inclusive social development based on the restoration, protection and sustainable use of natural resources and ecosystems. Prime Minister of Hungary, Viktor Orbán, opened four days of events, addressing a large audience of diplomats, global science stakeholders and key influencers.